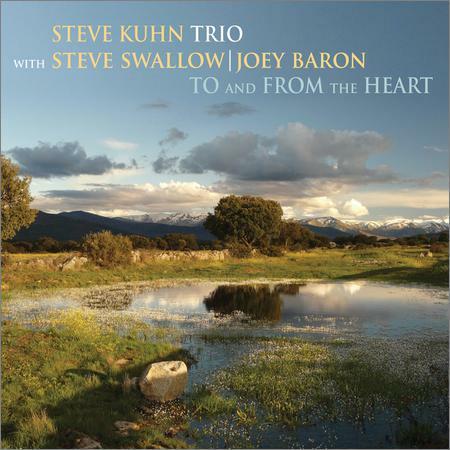 Steve Kuhn Trio (with Steve Swallow & Joey Baron) - To And From The Heart (2018) - Музыка mp3 - Каталог файлов - Развлекательный сайт! Now an octogenarian, Steve Kuhn's career has in 2018 spanned nearly sixty years, never having a long lull of time without recording new music. It becomes something of a marvel then that after all this time, the pianist still finds something new to say; he is still able to surprise listeners with songs they don't expect and improvisations they don't anticipate. He continues with the same trio he used on his previous release, At This Time... (Sunnyside, 2016) It should surprise no one how well these three mesh, considering their history. Kuhn and bassist Steve Swallow have worked together as far back as the 1960s, when they recorded with trumpeter and flugelhornist Art Farmer, who had yet to help create the Flumpet. Joey Baron meanwhile, has played drums on four albums with Kuhn, dating as far back as 1995. The trio has To And From the Heart open with the radiant "Thinking Out Loud," an original composition by Swallow, before easing perfectly into a beautiful and instantly recognisable rendition of the now classic Charlie and the Chocolate Factory tune, "Pure Imagination." With it's warm, romantic tone the song conjures the images of a crisp, cool city night, strolling hand in hand past pool halls, restaurants, and towering hotels. Swallow's long electric bass solo is rained over by Baron's cymbals before Kuhn masterfully brings the melody around for a final pass. In both these first songs it becomes clear how perfectly complementary the members of this trio are to each other. It's a kind of chemistry often taken for granted, but which exists only within a group of musicians such as this one. "Pure Imagination" is followed by two tender ballads, "Away" and "Never Let Me Go," the former of which is the second Swallow original and a simple, romantic song that feels just at home on the album. Baron's cymbals spur Kuhn forward on Michika Fukumori's mid-tempo "Into the New World" before descending into a 16-minute long convalescence of two of Kuhn's original compositions, titled "Trance/Oceans in the Sky." The lengthy, latter half of this musical concoction is a wonderful, emotional ride. At times ominous, at others hopeful, yet never jarring. It's this song that draws the listener in, demanding full and complete attention to the band's technical prowess. Baron's drums weave through speakers left and right while Kuhn's piano lays out a remarkable turn reminiscent of the spectacular finale to a fireworks show. It's not just the perfect ending to a thoughtful, emotional album, it's the song that makes the entire 50 minute ride memorable. Despite the relative age of the group, To and From the Heart never feels geriatric. Meting out innovation with the sort of self assured aplomb which comes from experience and long-honed talent, the Steve Kuhn Trio has yet another solid addition to their catalogue.